With gum disease affecting millions of Americans each year, it’s important to know that the health implications of this common condition can go well beyond red or inflamed gum tissue. Caused by a buildup of plaque and tartar, gum disease can eventually lead to bleeding of the gums, spaces between the teeth, loose teeth, and even tooth loss when left untreated. In addition to these side effects, recent research conducted by the University of Southampton and King’s College London is now showing a correlation between patients with gum disease and cases of Alzheimer’s, suggesting that it is more important than ever to promptly treat the earliest signs of gingivitis. 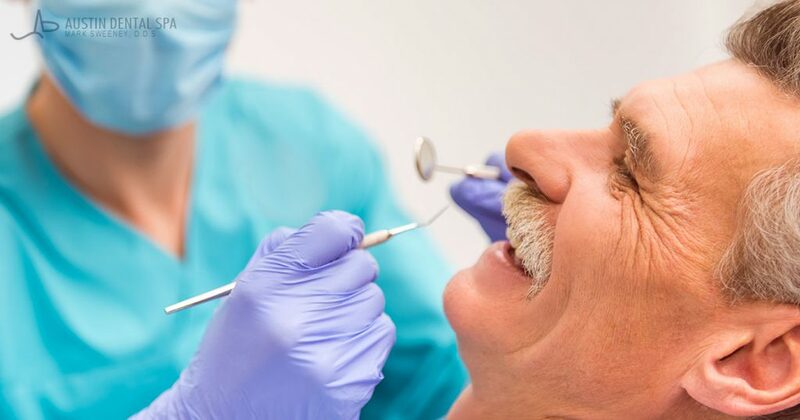 According to the Alzheimer’s Society, if the link between the two diseases proves accurate, maintaining good oral health and hygiene could slow the onset of dementia. Fortunately, at Austin Dental Spa, we offer a number of treatment options for patients suffering from gum disease. Technologies and techniques such as Micro-IDent® Plus and the Perio Protect® Method allow our cosmetic dentists to accurately identify harmful bacteria that could damage the soft tissue of the mouth as well as remove harmful biofilm. Additionally, deep scaling and root planing offer effective methods of cleaning pockets of bacteria along the gum line while simultaneously promoting the natural healing process. To learn more about gum disease treatment, or to schedule an appointment with either Dr. Mark Sweeney or Dr. Jordan Slagter, please contact our office today. Gum disease occurs in 75% of the population and recent research demonstrates that people are more inclined to experience gum disease in senior years. It has been determined that a drop in the level of Del-1, a chemical in the oral cavity, is responsible for poor gum health in seniors. The study results were founded based on research by the Queen Mary, University of London in collaboration with research groups in the USA. The study results were published in Nature Immunology. The research investigated gum disease in young and old mice and found that an increase in gum disease and bone loss in the older animals coincided with a drop in the level of Del-1. This protein is known to restrain the immune system by preventing white blood cells from sticking to and attacking mouth tissue. When the researchers treated the gums of the mice with Del-1, the number of white blood cells dropped, and gum disease and bone loss were reduced. These findings suggest there may be new methods to treat gum disease. In the meantime, a proactive approach to prevent gum disease is recommended for seniors, particularly for those who might have a more difficult time brushing and flossing. It is best to brush twice a day for two minutes each session while being certain to reach the gum line. Flossing is also essential to remove food debris caught between teeth. For those with gum disease, biofilm treatment is one of the latest treatments on the market to assist with keeping the oral cavity healthy. A select number of dentists across the U.S. offer biofilm treatment. People with gum disease may also require deep planing and root scaling treatment, laser and antibiotic therapy or periodontal surgery to prevent tooth loss from uncontrolled periodontal disease (gum disease). Gum disease is traditionally prevented by proper oral hygiene, professional dental cleanings, as well as, root planing and scaling when at risk. One day in the future the prevention of gum disease may be taken to new heights with an additional treatment designed to disrupt the connections between disease causing molecules and normal bacteria. In this way, there may be an opportunity to prevent gum disease and tooth loss associated with gum disease. Study results outlined in the journal Microbiology recently suggest that a new drug could be developed to target a molecule on the surface of Treponema called CTLP that acts as the open door for bacterium to access to the community of pathogens in the oral cavity. Once combined, TLP in conjunction with other bacterial molecules, can begin to inhibit blood clotting (otherwise leading to continued bleeding gums and causing tissue damage). Dental plaque is the result of acid production from bacteria and is a major cause of bleeding gums and gum disease. Gingivitis is the precursor to gum disease. Approximately 75% of the population has some form of gum disease. Gum disease has also been linked to a variety of diseases, including heart attack and stroke. So, a treatment that would prevent gum disease is very appealing to improve quality of life for many. The link between diabetes and gum disease is staggering. In the United States, 26 million people have diabetes, 95% of these people have gingivitis (precursor to gum disease) or gum disease and 76 million more are pre-diabetic. These statistics have created the demand for dentists to “brush up” on the latest in gum disease therapies. To date, there are only a select number of dentists that offer advanced treatment for gum disease. For example, Dr. Mark Sweeney offers bio film treatment to control unhealthy bacterium in the mouth that is linked to gum disease. In addition, dentists are in a good position to pre-screen for diabetes by identifying risk factors, such as, family history, obesity risk factors, medical condition risk factors, such as, hypertension and ethnicity risk factors, such as, African Americans, Pacific Islanders, Native Americans, Latinos and Hispanics. According to the Centers for Disease Control and Prevention, if the population of people with diabetes continues to grow at a steady rate, one out of every three people will have diabetes, not to mention the number who will then also have gum disease, the leading cause for tooth loss. In addition, dental treatment should not be avoided according to research which demonstrated people who have not been treated for gum disease are two times more likely to develop diabetes. People with diabetes also require special care when going for dental procedures because wound healing may be affected if proper precautions are not taken. Diabetic patients may also be more likely to develop hypoglycemia, particularly if they require insulin. For these reasons, patients should inform their dentists about any medical condition that have so that the dentist can take proper precautions to reduce the risks during dental treatment. Furthermore, regular dental treatment prevents and reduces infection and inflammation, which may reduce the risk of diabetes. So, regular dental treatment is very important for your oral and physical health. Have a Little Licorice, Keep Tooth Decay and Gum Disease Away? Licorice has been a household treat for many generations in the U.S. What may not be widely known in America is that licorice root has been used in Chinese medicine to treat a variety of ailments for many years. Recently, scientists led by Stefan Gafner published the results of their study in the ACS’ Journal of Natural Products demonstrating that substances in licorice may play a significant role in the prevention and treatment of tooth decay and gum disease. It is the dried root in licorice (not found in U.S. licorice) that contains powerful active ingredients which may prevent and treat oral conditions. Two ingredients, licoricidin and licorisoflavan A, killed two of the major bacteria responsible for dental cavities and two of the bacteria that contribute to gum disease. Licoricidin also killed a third gum disease bacterium. The scientific researchers indicate that these substances may be able to treat or even prevent oral infections. Licorice root can be purchased in the U.S. However, Licorice root is associated with potential side effects. So, people should check with their physician before taking licorice root. In terms of the impact of study results, more work will be required to see if the active ingredients in licorice root can be isolated to prevent and treat gum disease and tooth decay. In the meantime, regular dental check-ups, a proper oral hygiene regimen, and professional tooth cleanings are the best means to prevent tooth decay and gum disease. Enjoy a good night’s sleep, hang out with your best buds, make new friends and begin new hobbies, all while controlling your weight can certainly be worthwhile. But who would have known that you’d be controlling your gum disease while controlling your weight. Recently, Case Western Reserve University School of Dental Medicine researchers reported that people who lose fat cells offer their body a better opportunity to fight off gum disease. The study results were compiled following testing of over 30 people with an average body mass index of 39; half of which had the gastric bypass procedure and abdominal fat removed. All study participants had gingivitis or gum disease and received treatment for gum disease. In the end, the study participants who had surgery achieved better success in the management of gum disease, including: periodontal attachment, bleeding, probing depths and plaque levels. So, a two for one bonus is certainly appealing. Of course, there are several theories as to why this occurred. Though, certainly the study results can be a motivating factor to control your weight. Now, let’s check to some tips to keep you in shape! Aerobic Exercise: It’s important to perform aerobic exercise at least 25 minutes per day and up to one and a half hours if you are interested in losing weight. Aerobic exercise is defined by any exercise in which one foot is off the floor, such as, walking, running, biking. Strength Training Exercise: Muscular strength training for at least 30 minutes three times a week, including all major muscles, is vital. Muscular strength training elevates your metabolism which assists in fat burning.